I started blogging close to five years ago. I had no clue what I was doing, how to start a blog or anything else – in short, it’d be generous to call me a beginner. Fast forward nearly five years, and I’ve more than replaced the income from my day job through this blog and run a business from home with my wife. My story isn’t that unique; the Internet is full of people who make good money through a website. 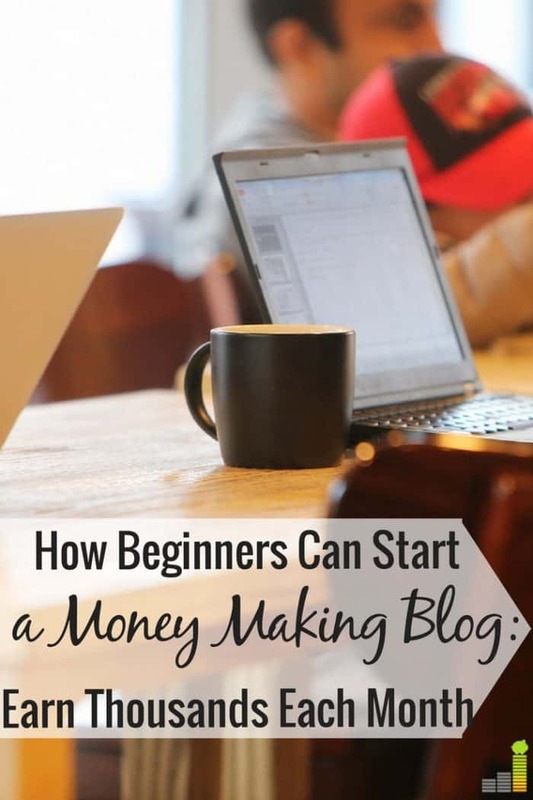 If you’d like to start a blog but don’t know where to begin this post will give you the tips and strategies needed to grow your own profitable blog. There are countless areas you can focus on with a blog. I chose personal finance because I love helping people with their money and have a background in finance. There are many other blogging niches, from travel to mommy blogs, to faith-based and more. You want to find something you’re passionate about for your blog. Blogging takes a lot of time and work, and if your heart isn’t in it, then it will get old very quickly. I’ll also caution you not to take too much time analyzing the focus of your blog. Yes, you do want it to be something you care about, but the last thing you want is to overanalyze it and do nothing. Half the beauty of blogging is that it’s your website so you can make it whatever you want as it grows. Now that you’ve decided on a topic to cover, it’s time to get down to the technical aspect of starting a blog. I know that sounds overwhelming. It’s not. If I can start a blog and be profitable, you can as well – here’s my step-by-step guide on how to start a blog to help you through the process. Decide on a Domain Name: This is the name of your website. You can choose whatever you want, so long as it’s not already being used by someone else. You will want to use GoDaddy to buy your domain name. They’re the most well-known domain broker in the industry and have great pricing. Choose A Host: Now that you have the name of your site, you need a host. You have two options – self-hosted or a free hosting platform like Blogger. I know you think the free option is better; it’s not. If you have any plans on making money from your blog, you need to go the self-hosted route. 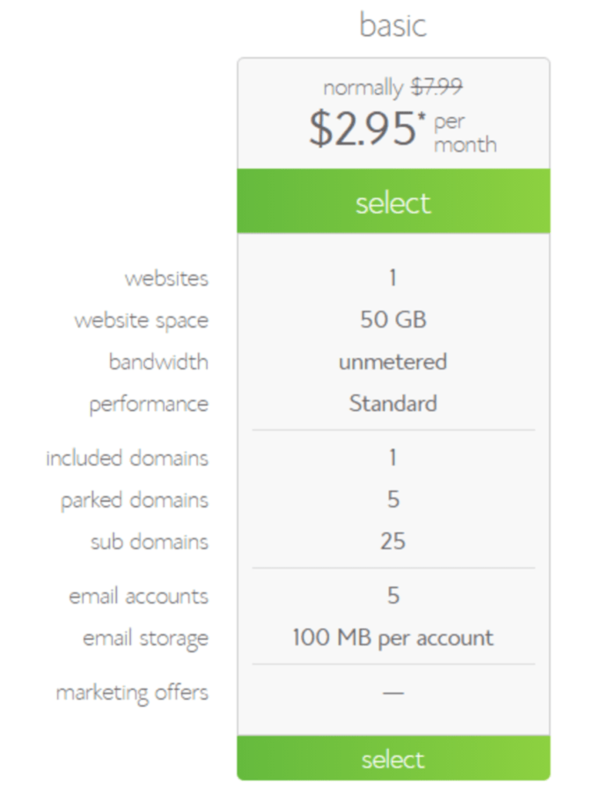 Bluehost costs $2.95 per month when you sign up through my link. That’s extremely cheap. One-click installation. If you’re not technically inclined, Bluehost allows you to install WordPress (the platform you need to use if you self-host) with one simple click. 24/7 Support. Let’s face it; a blog lives online 24 hours a day. If you need help with a problem, they’re there 24 hours per day. You will see three different options. If you’re a new blogger, you will be fine with the $2.95 per month plan. While you can get your domain name through GoDaddy, you get a free domain name with Bluehost when you signup through my link. If you don’t have a domain name, simply input it. If you already have one, select the “Transfer Domain” option. From there you simply add in your billing information, and you’re good to go to the next step – connecting WordPress. This will take you to another page. You will want to look for a tab that says “website builders” and select “Install WordPress.” You click on that button, and it takes care of everything for you, so you have a live blog. It will ask you to set up a user name and password. Please, please, please don’t use “admin” as the user name. Select something that’s unique as that will protect your site from hackers. Once you’re done, you’ve got an honest to goodness blog. Starting a blog and getting it up and running is just a small part of the battle. 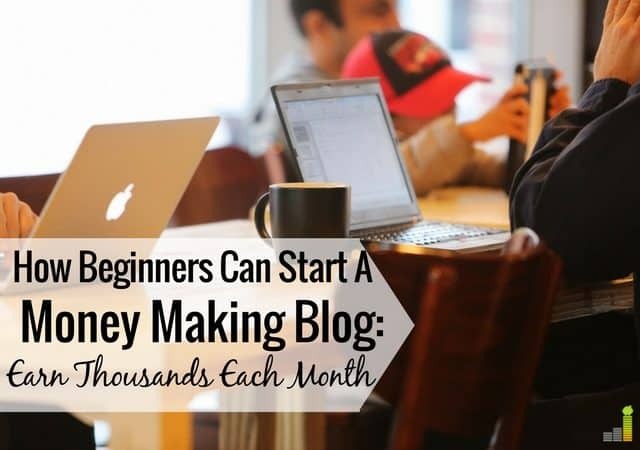 If you want to make money blogging, or simply grow your blog, there are many other blogging tips to keep in mind. Have a consistent posting schedule. You don’t want to make readers guess when you’ll post. You want them to know what to expect. Having a consistent schedule will bring readers back. It doesn’t matter if you have a new post once a week, or everyday, it’s your site after all, but make sure it’s consistent. Comment on other blogs. Commenting on other blogs has multiple benefits. It helps you build relationships with other bloggers. It also helps get your name out to other blog readers. There’s no magic number, but the more you comment, the more it gets your name out there. Reach out to other bloggers. I know it might seem that other bloggers are your competition. They’re not. Think of reaching out to other bloggers as networking. You never know how you might be able to help each other down the road and you will meet some genuinely nice people. I’ve made some great friends through reaching out to and working with other bloggers. Backup your site. This is a must follow in my opinion. There are many spammers out there, and you never know what one might be able to do, not to mention anything else that can go wrong with a site. The last thing you want is for your site to get hacked and have no backup of the site. Thankfully there are plugins, like Backup Buddy, that simplify this for you, so you don’t have to do anything too technical. Respond to comments. If you want to build a community, this is very important, especially as you begin. No matter how long or short the comment, you should respond so the person. Not doing so makes it easy for the person think you’re ignoring them and they’ll be less likely to come back. This doesn’t mean you have to respond the moment a comment comes through, but it is important to be timely. By following some of these tips, you’ll be surprised at how your site grows, giving you more opportunities down the road. When I explain to friends and family members that I make money blogging, they give me a confused look not understanding how it works. In reality, I earn my income through blogging, and many other bloggers do. Display advertising. This is one of the most common ways bloggers make money. If you’ve spent any time on the web, you’ve likely seen display ads. Many companies use this as another way to advertise their products. Google AdSense and Media.Net are examples of display ad companies you can work with to earn money. Affiliate advertising. Affiliate advertising is one of the best ways to make money blogging. You promote products you like on your site – such as something from Amazon, a banking product or something else and when a person uses your link to buy the product you get a small commission. My friend Michelle makes over $50,000 per month just through affiliate marketing. If you want to start with affiliate advertising and learn some of her best tips to make money from affiliate marketing, sign up for her course to get started. Freelance writing. One of the best parts of a blog is that it serves as a portfolio of your writing talent. If you like to write, it’s possible you can make money from freelance writing for blogs or companies. My wife and I both freelance write on the side and make decent money from it. If you want to make money freelance writing, sign up for my friend Cat’s course – Get paid to write for blogs. Public speaking. If you like to speak publicly and feel passionate about a certain topic you can use your blog as a means to make money from speaking. This will admittedly take some time to grow into a role like this, but you can make great money from giving talks. There are many other ways to make money blogging; the above list only scratches the surface. There’s been a lot in this post. Just remember one thing, blogging should be fun. You get to make what you want of it, and if you put some time and work into your site, it’s possible you can even make money from your blog. Commenting and building relationships is VERY important in the beginning. Once you have started to build links, relationships with other bloggers/writers and readers, your content has to speak for itself. A blog with bad content can keep going for a long time just on pure commenting and link-building, but at some point the content has to push your site above other sites and really other forms of entertainment and information. I think you are doing a great job and I like to think I am as well! I completely agree DC. That relationship building takes time, but is needed and well worth it in the end. Thanks for the kind words and think you’re doing great as well! I echo DC on that one, and you two are doing a terrific job! I have been reading PF blogs for about 4 years and people drop here and there a few hints about their struggles and what is working for them. Jeremy made it much easier for us, which is awesome. You can also look into specific SEO pros blogs, like Pat Flynn’s, but how much you get out of it depends on the direction you want to take with your blog. Thanks Pauline. You’re not doing too bad yourself either! 🙂 I agree that Jeremy has made a lot of things much easier and has been a great resource to me when I have questions. Good post! You’ve done very well for yourself that’s for sure! I’m worried about managing my blog when I go back to work and have no computer access/seeing patients all day, it’s hard. Thanks for all the tips! Thanks Catherine! I’ve not done it all myself though and am excited to see where the blog goes in the future. Time management is a huge thing with a blog because it can be a time hog. These are all great tips! I definitely agree with being social. Reach out to other bloggers and your readers and make some great friends. You’re right on Michelle. Developing those relationships is key to success. I’ve met some great people already, and look forward to getting to know more. I am right with you Holly! I need all I can get, so help is always appreciated. Social is the most important. I have met some awesome people who have reached out to me or that I have reached out to over the past few months. I agree Sean. I’ve met some great people and being social is vital to that. Greats tips and congrats on lowering the Alexa. I like the commenting(good thoughtful comments) and having good content. I know that a lot of people are concerned with traffic but it means nothing if they come to your site and don’t want to ever come back. Its almost the same as having great content but no one knows that you exist. Thanks Thomas! Keeping them coming back is key, otherwise you’re just talking to yourself. Thanks for stopping by. I’ve seen social people with bad content get well ahead of blogs with great content and no social, so I’d make sure and share. I think lots of new bloggers think they should post more often to gain traffic. Use this time to spend in the community. That’s more valuable than a post every day. I do think that in the end, good content wins the day. You can’t spend every day forever visiting a ton of blogs to get people to visit your site. With bad content, people won’t come back on their own. It’ll be a never-ending job just getting them to come back. Great point Joe! Being social really does help take your blog to the next level. I am still learning how to balance the time I spend sharing and on other blogs vs. quality content for mine. If you’re not sharing AND your content is bad, then you’ll need to look for other ways to keep them coming back. I know, it takes A LOT of time! But then again, what things that are worthwhile not time consuming? I think there’s a balance to be had and between sharing and your own blogging so others will want to come back. Great tips here for sure. It does really take a lot of time at the beginning, but I believe as you grow, you familiarize yourself with the blogs you enjoy, build good relationships and can pull your foot off the gas a little. I’m nowhere near there just yet, but I also enjoy reading all the blogs around town! I just don’t have time to read them all, which is a bummer. Thanks Jacob! I agree, that over time you take ease up a little and maybe place focus on other things to promote your blog. I agree about not having enough time in the day to read everything, especially with so much good content out there. Wow, didn’t you just join the challenge? You’re blog is on steroids! My best tip would be to share as openly as possible and not be afraid of linking to other bloggers. Also, I noticed that many people never bother to leave feedback to comments on THEIR OWN BLOGS. To me that just seems rude… I understand if you don’t care to read my blog but at least address comments on your own blog. It’s supposed to be a community, with sharing and caring not a 1-way highway. I was wondering who would be the first one to mention it, and you’re the winner Veronica! I TOTALLY agree about those who do not respond to the comments on their own blogs. I know it takes time, but unless you’re getting hundreds of comments, how much time does it take to respond with a few sentences? You’re right in that it’s a community and I think responding to comments just further helps building those relationships which are vital. For the first 3 months of my blog I visited and commented on tons of blogs and spent a great deal of time on Twitter as well as posting 4 days a week. By the end of the 3rd month I was exhausted and ended up take an entire week off. After a while it is difficult to keep up the momentum. I like your idea of just visiting 10 or so blogs each day instead. It does take a lot of time. My wife has been commenting that her husband is a computer lately as I’ve been on it so much. That said, there’s a balance to have and it takes time to find it. I think these tips are spot on! Way to go! One thing I would add would be to harness twitter’s firepower to drive others to your site as well-it doesn’t help with Alexa, but it’s not the most important thing. Thanks Lauren. Twitter is a great tool to use to drive people to your site. Great tips — I wish I’d known the “stop posting all the time and share content” trick when I was starting out. Now I post 3X a week and have as much traffic as when I was posting 5X. I know Kathleen. I am going to keep at it awhile with the 5X per week. I think eventually I’ll be going to a 3X per week schedule to help avoid burn out. Thanks for sharing those tips. Although it takes time to post coherent comments to blog articles, as you mention, it’s a valuable part of the process that really boosts that interaction. I also focus more on producing useful blog article with (hopefully) longer tails, than doing a large quantity. I agree Terry. It really can help foster relationship building with other bloggers. That’s a great point to have useful posts as opposed to throwing just anything out there. Great tips. The biggest thing for me is building relationships and commenting. You meet so many great people and you learn a lot in the process. Plus it helps build your traffic. I completely agree Miss T. There are many great people out there in the blogosphere and you can learn quite a bit from them. Commenting and doing guest posts have been great for me. Definitely helped me drive up my ranking and get my blog noticed! That’s a great point Cat. I am just starting to look at doing some guest posts, I know it can be a very useful tool to drive new people to your site. I certainly should be a prime example that persistence pays off. I installed the toolbar in mid August and am around 176K now with little technical knowledge. I had never even visited the twitter website until I got the blog up and running. It does take tons of time to comment and read everyday, but I actually enjoy it. I don’t know where I’ll end up eventually with the blog, but as long as it’s fun, I’ll keep it up. Most bloggers I’ve interacted with have been more than helpful, so that encourages you to always better yourself and your content. You’re doing a great job and I’ve enjoyed seeing you grow. I am the same way Kim. I never had Twitter before I started my blog and have little technical know how. That’s why I am so thankful for all of the help that many provide in the blogosphere. You’re doing great as well and always enjoys reading your posts. Great post and ya Jeremy is a pretty knowledgeable guy! Awesome! Thanks for the mention John. I really hope people find that explanation helpful. I know I was completely clueless when I first started! I’ll say – you have really made use of the commenting and being social advice! Keep up the good work! Not a problem MMD. I’ve found it quite helpful information. You are doing great at getting a lot of commenters! and yes, it does take tons of time. Thanks Marie. I agree it does take quite a bit of time, but I think the payoff can be worth it. Wow congratulations on your success. I have to say, that out of all of the posts I have been searching about this subject this one was the most helpful I have found. Usually site will offer their advice, only to bring you a sales pitch and a link to their book or paid membership for their site. I really need to look into this Alexia site. I am glad that you found my post helpful. As I said in the post, my success is due in large part to the help I’ve received from others out there. Thanks for your kind words as well, I am glad to be of help. I am not much of a salesman, so even if I tried it would be a failure. Thanks for stopping by! Great post, short and simple. As a new blogger I have been struggling with the learning curve of wordpress as well as time to create content. Thank you for being honest about knowing absolutely nothing when you started blogging. At times I’ve felt in over my head and its reassuring to know that it’s something most bloggers go through. Thanks Marvin. I am still on that learning curve. 🙂 The great thing is that there’s a lot of great info out there and there are many great bloggers out there willing to help. Thanks for stopping by! John, I was actually wondering the other day how you rocked your Alexa score below 200k in no time flat. Very helpful post… I also try to do the same, but find my time so limited with my other responsibilities (non-blogging) that sometimes I can only comment on a few sites a day. I think a lot of it has just come down to commenting tons and sharing as much as I can. It does take A LOT of time, but it is worth it if you can drive traffic to your site. I can completely understand on non blogging responsibilities, you have to have balance. Congratulations, you have done tremendously well in such a short period of time John. It just goes to show that if you are ready to put in a solid effort you will get handsomely rewarded. Great post mate. I agree commenting takes time and if you have a family and a full-time job aside from a blog you have to have a strategy. ie: how many comments per day etc. I comment when I find a few minutes here and there but only after I read an entire post. There’s nothing that gets my gears fired up when someone doesn’t read a post or leaves one or two words just to get a comment in. If I have nothing to say, I won’t bother at all but that’s just me. I like to build relationships with bloggers that want to be part of what I call a “team” of people who want to help others like I do. This is more important to me than where the next buck is coming from or being part of the “in group”. If money is the end all be all for a blogger well then I don’t expect much in way of building relationships note I said end all be all. Cheers and thanks for the tips. I have the Alexa toolbar as do some of my Fans who have downloaded it from my blog. Cheers Mr.CBB P.S I can guest post if you would like. Great points Mr. CBB. It does take a strategy because there are so many blogs out there and many of them are very good. If you don’t have one, then time just gets away from you. Excellent point of looking at blogging as being part of a team. While we all have similar outlooks, they’re also different and the combined whole provides a great wealth of information that’s just not possible to get in one place. I view money as simply a side benefit from all of this as my ultimate goal is much like yours and to help others. Good tips and thanks for sharing. Though I’ve been blogging for a couple of years, I’ve just started to ramp it up earlier this year. I’m at the point of looking at blogging and related activities as potentially another profit center to dovetail with my main business of being a financial advisor so I am always on the lookout for good ideas like the one’s you’ve shared here. Thanks again. Thanks Roger. That’s great you can use it as a way to somewhat supplement your main income. I hope to be at that point sometime in the future. Thanks for stopping by! Great tips! Jeremy @ Modest Money also helped Todd and I out a lot. Jon @ Free Money Wisdom was are biggest supporter…it helps that we were already friends and he really got me into blogging. It’s awesome to see your site going strong and productive in such a short time. Looking forward to seeing where it goes! Thanks John! Yea, Jeremy has been a life saver for me on more than one occasion. I have a few friends as well who blog and it’s nice to get their perspective. They’re also not in the PF niche, so it can be helpful to get an outsiders perspective. I am pretty happy with the growth as well and look forward to seeing where it’s going too. There is so much content to take in that it can be overwhelming. But I would echo two things, content is king (in the long run) but becoming a part of the “party” is almost as important. You may have a great story, but if you’re a wallflower, no one’s going to hear it. Welcome to the New Frugal Rules!